Nick Foles, starting his first playoff game since 2013, helped lead Philadelphia on their opening drive, completing his first three passes, two to Torrey Smith and one to Alshon Jeffery. However, that would only pick up one first down and 21 yards. Jay Ajayi would add 17 yards on four carries helping push the offense to the Falcons 37 yard line. But on 2nd down, Foles would be intercepted by Deion Jones. Starting at his 30, Matt Ryan would go 3 for 3 on the drive, finding Julio Jones (15 yards), Mohamed Sanu (28 yards) and finally Tevin Coleman (18 yards) for a touchdown. Philly would punt the back to Atlanta, but early in the 2nd quarter, the Eagles defense would pick off Matt Ryan and Jalen Mills would return it to the Falcons 23. Philadelphia would be forced to kick a 35 yard field goal. Atlanta would fail to get things going on their next possession, and the Eagles would start their next drive at their own 47 yard line. It took one play to give Philadelphia the lead, with Foles and Nelson Agholor hooking up on a 51 yard touchdown. Eagles take a 10-7 lead. Atlanta would respond, thanks to 27 yards on the ground and 22 receiving yards by Devonta Freeman set up the Falcons in the red zone. Matt Ryan would then find Julio Jones on a 14 yard pass before connecting with Austin Hooper from 7 yards out for a TD. Falcons back on top 14-10. 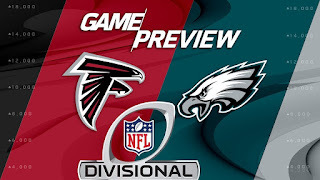 Philadelphia would be forced to punt on their next drive, but the defense would step up once again, this time it was Ronald Darby with the forced fumble and recovery. The Eagles would take over at their own 43. Unable to move the football, Philly punted but pinned Atlanta inside their own 10 yard line. Matt Ryan picked apart the Eagles secondary as he led the Falcons on a 91 yard touchdown drive with less than two minutes remaining in the half. The drive started and ended with completions to Julio Jones, but Ryan also completed passes to Gabriel (x2), Sanu and Hooper. Falcons lead 21-10 at halftime. The third quarter was quiet, with a Matt Bryant 28 yard field goal being the only score, but it ended with the Eagles driving, entering the fourth quarter. This possession started with 5:29 left in the 3rd, and saw six carries by Ajayi and four completions by Foles, picking up five first downs. The first play of the fourth quarter was a 10 yard touchdown throw by Nick Foles, caught by Alshon Jefery. Atlanta would sustain a drive in the middle of the fourth quarter, with a one score lead, that would last nearly five minutes, only to see a 41 yard field goal attempt blocked by the Eagles special teams. However, Foles would be intercepted on the next possession, by De'Vondre Campbell. The Falcons would turn that into points, this time successfully kicking a 48 yard FG. Falcons extend their lead, 27-17. As we approached the two minutes warning, the Eagles had no other choice but to go for in on fourth down from inside their own 30, but Foles could not complete the pass. The Falcons quickly turned that into a 3 yard touchdown to Austin Hooper, after a defensive pass interference and defensive holding penalty move them inside the Eagles 5 yard line. With less than two minutes remaining, Atlanta leads 34-17. The Eagles would drive as time would expire on their amazing season and Jay Ajayi would score a meaningless touchdown as time expired. Foles and Zach Ertz padded their stats on the drive, with three completions for 53 yards.